Fright Nights, the UK’s leading ghost hunting specialist, is to host the first ever ghost festival in the historic town of Stratford-upon-Avon. The ‘Stratford-upon-Avon Ghost Festival’ will take place from 18 – 21 June at a number of haunted locations including the notoriously haunted ‘The Falstaff’s Experience’, The White Swan Hotel and the Stratford-upon-Avon Town Hall. The four day spectacular event, which is a must for anyone interested in the paranormal, will feature ghost walks, overnight ghost investigations, paranormal workshops, séances and psychic fairs. 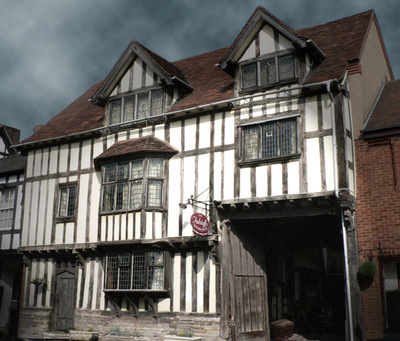 With more than 40 spirits residing within the building, it is not surprising that The Falstaff’s Experience is known as one of the UK’s most haunted buildings. Dominant spirits include an archer from the time of Henry VIII; a serial murderer from the 18th century; a little girl who was a pickpocket in the tavern and a catholic gentleman from the time of the reformation. Steeped in history, The White Swan Hotel is the oldest building in Stratford dating back from 1450 and where legend has it, is where Shakespeare bought his daily loaf of bread. Through séances, Fright Nights are hoping to reveal the true identity of the ghosts that haunt the ancient building. Stratford Town Hall was built in the reign of Charles I and throughout its chequered history has seen many calamitous events. In 2004, ‘Most Haunted’ broadcast live from the Town Hall during a special programme in which the studio voted for a couple to sleep in the most haunted building in the town. The Ghost Festival kicks off on Thursday 18 June from 7pm – 2am with a ghost tour around the town followed by a ghost hunt at The Falstaff’s Experience. Tickets cost £55 per person. On Friday 19 June from 7pm – 10pm, medium Mandy Masters, a major contributor to leading psychic magazine Take a Break’s Fate & Fortune will demonstrate her mediumship abilities and communicate with spirits related to the attendees from the Stratford Town Hall Ballroom. Tickets cost £15 per person. On the same night from 10pm – 4am, celebrity TV medium Ian Lawman, renowned as one of the world’s leading mediums and exorcists, will visit The Falstaffs Experience for an exclusive overnight ghost hunt. With the use of state of the art ghost hunting and psychic equipment, Ian and a team of investigators will help the public try and encounter the chilling world of the paranormal during this exclusive first time event. Tickets cost £69 per person. On Saturday 20 June members of the public can take part in an overnight ghost hunt and paranormal workshop at The Falstaff’s Experience from 9pm – 4am. Tickets cost £65 per person. On the same day Paul Bell and Chris Melek will demonstrate an authentic Victorian séance including mesmerism, automatic writing and glass moving at the White Swan hotel from 7pm – midnight. Paul Bell has worked as a professional magician, mind-reader and psychic for the past ten years. As a member of the exclusive British Society of Mystery Entertainers, Paul is well-versed in all aspects of the psychic craft and is an accomplished tarot card and palm reader and a respected authority on Victorian Spiritualism and séance room etiquette. Chris Melek, an intuitive psychic, will also demonstrate the physical manifestations of his unusual gift. The event will end with a grand vigil in the dark as both Chris and Paul use their gifts and experience to communicate with the spirits. Tickets cost £29 per person. This unique ghost festival culminates with a psychic fair and open day at The Falstaff’s Experience on Sunday 21 June from 10am - 8pm. The psychic fair is free to attend. Spooky mediumship walks with Roy Roberts, recently awarded “London’s Best Medium” will take place on the hour from 5pm - 8pm. Tickets for the walks cost £12 per person. Louise Jeffrey, Managing Director of Fright Nights said "We are delighted to be hosting this unique ghost festival in Stratford-upon-Avon which will see some of the most experienced paranormal experts converge in Stratford for a spectacular four day event. With a town steeped in so much history and with so many reported ghostly sightings, Stratford is the ideal location for our ghost festival”. Tickets for the above events can be purchased online at Frightnights.co.uk.